You can now get a personalised video of your ride on The Flume as part of the YourDay DVD souvenir. As with other YourDay rides, you can either purchase a single DVD of just your ride on The Flume, or a multi-ride DVD containing the latest addition. YourDay, which launched this time last year, initially had teething problems with their systems; the souvenir was originally planned to be available from the start of the 2007 open season. Now that the majority of the glitches have been ironed out, the company are moving forward by completing the ride line-up they had originally planned. The Flume "went live" on Thursday morning, which means that the next ride to be enabled will be the Congo River Rapids. 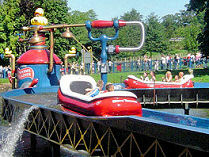 The delay in adding these rides to the DVD has been due to the unique challenges posed by the timing of water rides - for example, if a Rapids boat is overtaken by another boat on the course. Once the Rapids have been added to the DVD, YourDay will discuss with Alton Towers whether they want to add even more rides to the product, or perhaps add more personalised footage to the existing attractions. They have also recently launched a Facebook fan page. Go to the special events throughout the year for added value for money.